This was one of the first designs I did, way back in February of 2012. Although there may eventually be some refining of the final design, I am still rather fond of these two and think they will sit comfortably next to the rest. Or, rather, will shoot guns and generally act like cads to Toady. 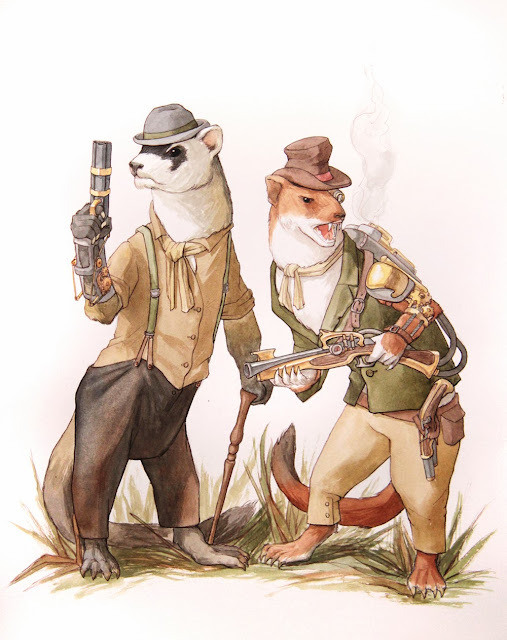 In fitting into the maker theme, although they are rowdy and unruly I imagine the stoats and weasels to be quite the ingenious makers. They would be low-tech, greasy, street-urchin style makers, but I think they would produce some of the most clever and devious tools to achieve their ends. And, to paraphrase Ratty, you can't trust them, but they are all right in their own way.